Our dentists also offer a take home bleaching kit that can achieve similar results over a longer period of time. An impression is taken of your teeth and two custom made trays are made to contain the bleaching gel. Patients take the trays and gel home and are advised to wear the trays for prolonged periods (usually through the night) for several sessions until the bleaching process is complete. Results using this method are comparable to Zoom however some patients find it a less convenient method of whitening their teeth. For over 150 years fillings have been made out of a grey-silver material called ‘amalgam’. This is strong and long lasting. However, many people find it unattractive or are concerned about possible health risks. New materials mean it is much easier to find a perfect colour match to a particular tooth. In most cases, it is impossible to see that the tooth even has a filling. White filling material can be used to cover unsightly marks on teeth, repair chipped or broken front teeth, enhance the shape of front teeth. White/Composite fillings are a popular alternative to amalgam fillings. A tooth-coloured material can be use to restore chipped, cracked or stained teeth, as well as fill gaps between teeth. Composite bonding is also suitable for patients who have teeth with dark stains that do not respond to bleaching. The dentist will first perform an evaluation to see if the patient is a good candidate for the procedure. For old or broken fillings, they are simply removed and replaced with composite resin. For teeth which are chipped, cracked or discoloured, they will first be prepared by lightly roughening the area to be repaired. The tooth will also be cleaned before a tooth-coloured composite resin is applied to it and moulded into the proper shape. Several layers may need to be applied in order to duplicate the depth of colour of the natural teeth. After the composite resin is hardened using a special high intensity light, the dentist will further shape and polish it until it matches the patient’s other natural teeth. Crowns are used to restore teeth that have been damaged, are badly broken or heavily filled, in order to restore their appearance or strength. They in turn reduce the risk of heavily decayed teeth breaking. To make a crown, the existing tooth is shaped and an impression is taken. The crown is then made by a dental technician, who is responsible for matching the shade and shape to your natural tooth. Crowns are made from a variety of different materials, such as porcelain or porcelain bonded to gold. Our dentists recommend porcelain crowns for the most natural looking and pleasing result. Bridges are units of false teeth that are fixed to remaining natural teeth to fill a gap. A bridge may take the place of one or more missing teeth and the results can be excellent with good function and aesthetic results. With careful maintenance a well-made bridge can last many years. The bone in the jaw surrounding the missing tooth or teeth can continue to recede. Bridges are ideal for people who have just one or two teeth missing or who prefer not to wear dentures. A norl bridge is made by crowning the teeth on either side of the gap and attaching a false tooth in the middle. They are fixed the same way as crowns. Bridges are usually made of porcelain bonded to gold, or occasionally just porcelain. 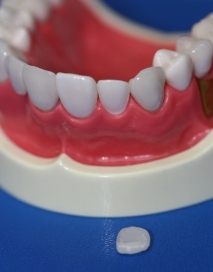 Adhesive bridges can also be made which do not require drilling the adjacent teeth. The false tooth is then attached to two metal wings on either side. These wings are then bonded, using a very strong resin, to the back of the adjacent teeth. Veneers are an ideal way of treating discoloured or unsightly teeth, closing gaps between front teeth or repairing chips and cracks. They are thin slices of porcelain that are precisely made to fit over the visible surface of front teeth, like a false fingernail would fit over a nail. To make a veneer, a very small amount of enamel is removed from your tooth. An impression is taken for the veneer to be made in the laboratory and then bonded to the tooth. They match the colour, appearance and translucence of your natural teeth. Dental Implants are the best substitutes for natural teeth offering you a permanent and secure solution for replacing one or more teeth. Dental Implants are essentially a screw that is placed into the jaw at the surgical stage. Once the implant has been attached to the jawbone and a period of healing has passed, the replacement tooth is attached to the implant. Implants can be used to replace single or multiple missing teeth. They can also be used to anchor bridges or to help stabilize and support removable partial and full dentures In all cases, dental implants can result in a significant improvement in your quality of life. Beneficial to your diet – you can eat and chew again without pain or irritation. Foods that were forbidden are now back in the diet!